Several wonderful pictures, wgich show well-known Berlin landmarks lit up in numerous bright colours have been released during Festival of Lights. Nowodays the Festival of Lights can boast an impressive diversity of light installations. This year, the range consists of colourful designs that are forecast onto landmarks all over the city such as the Berlin Cathedral, the Faculty of Law building of the Humboldt University and the Brandenburg Gate. 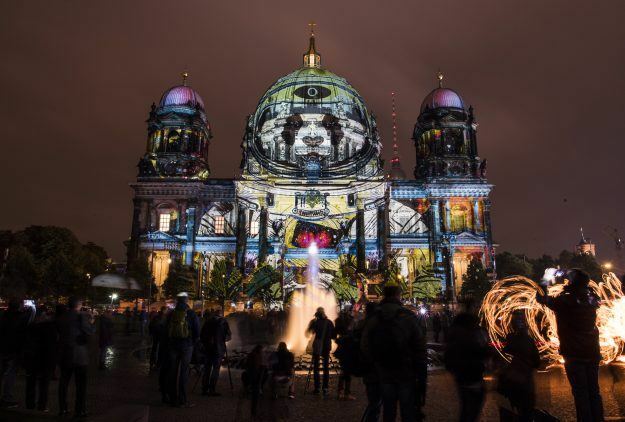 The festival held for ten nights under the patronage of the Governing Mayor of Berlin, Michael Muller, and featured a range of artists who told interesting stories, shared amazing art and staged pieces that lit up streets, squares and landmarks all over Berlin. Enty to all of the installations was free, the festival included a LightSeeing tour program, offering adventure tours by bus, boat, Segway and foot. Over the past ten years, the event has become even more popular and has been developing into the main tourist attraction. In 2015 the Festival of Lights attracted over two million festival visitors from all over the world.